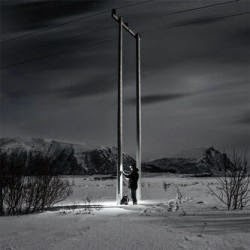 The debut full length LP for London-based American Eric Holm released by Bristol's Subtext this month is a mind shattering exploration of sounds created by fixing contact microphones to telegraph poles that connect the islands of Andøya, a northernmost island in the Vesterålen archipelago, situated about 300 kilometers inside the Arctic Circle. Eric Holm then mixed, edited and tailored his sound materials into a six-piece soundscape of desolation, solitude, coldness and total remoteness. The result is at times bordering on industrial music with unfathomable syncopated tribal beats as well as the darkest of ambient music with guts-shuddering low end frequencies. The magnificent album cover is a perfect illustration of this challenging and breathtaking album which reveals more and more details at each listen. A strangely natural yet unnatural experience. Spook it for yourself below (The track "Åse" appears twice, sorry for this).